New U.S. Census Bureau estimates indicate that Rockford, the third largest city in Illinois, is leading the state in population decline. From July 1, 2010 to July 1, 2014, Rockford’s population declined by 2.5 percent or 3,840 people—the biggest numerical drop of any Illinois city during that period, according to census data provided to Northern Illinois University’s Center for Governmental Studies (CGS). 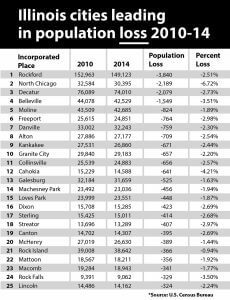 Further, the adjacent towns of Machesney Park and Loves Park also were among the top 15 communities for population declines during that four-year stretch, losing 456 and 448 residents, respectively. Illinois has nearly 1,300 incorporated villages, towns and cities. 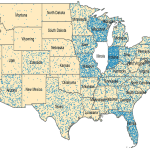 CGS monitors demographic changes in Illinois as a coordinating agency in the U.S. Census Bureau State Data Center Network. 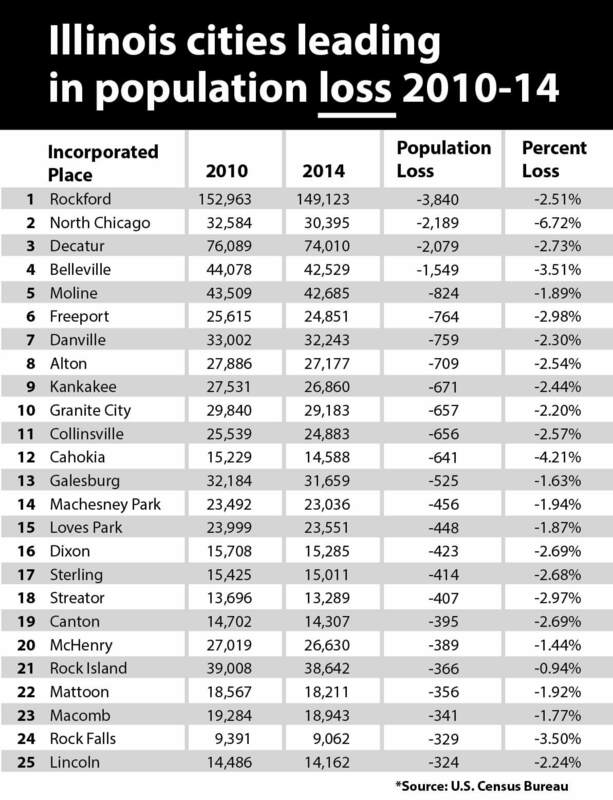 Suburban North Chicago was second on the list of towns seeing the greatest population decline, losing 2,189 residents, followed by Decatur (-2,079), Belleville (-1,549), Moline (-824), Freeport (-764) and Danville (-759). “Population loss might be a greater concern for larger communities because of population-based aid they receive from state and federal sources,” says Eric Zeemering, a professor of public administration at NIU. He says towns that are losing a substantial number of residents need to make adjustments. 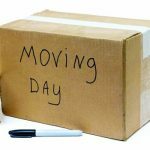 In March, CGS reported that census data showed Illinois had nearly 10,000 fewer residents in 2014 than in the previous year – the largest numerical decline of any state in the nation and the first statewide population dip since the mid-1980s. Many cities in Illinois continue to grow, including Chicago, which added 25,070 people from 2010 to 2014. That amounts to modest growth of just under 1 percent. 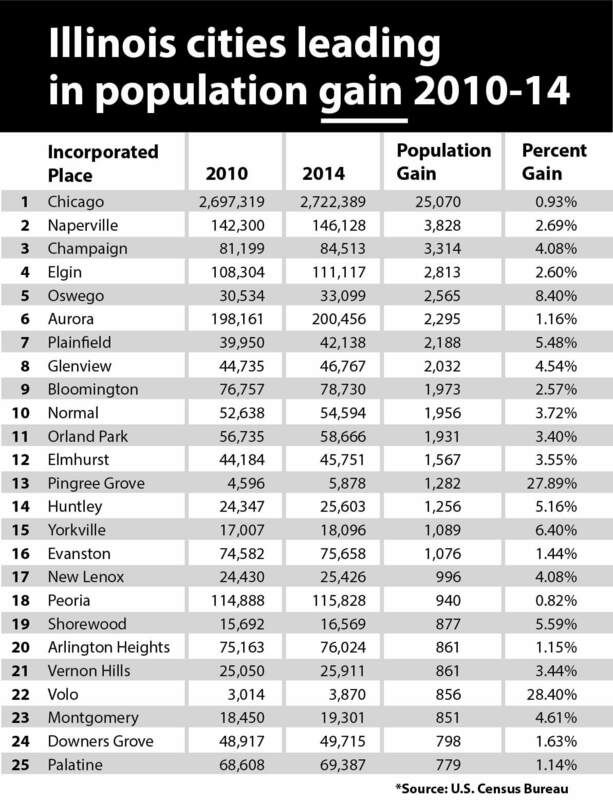 Naperville added 3,828 residents, the second largest numerical increase of Illinois cities, followed by Champaign (3,314), Elgin (2,813), Oswego (2,565), Aurora (2,295) and Plainfield (2,188). If current trends continue, Joliet and Naperville, the fourth and fifth largest Illinois cities respectively, will surpass Rockford in population size within the next year or two, Taylor says. 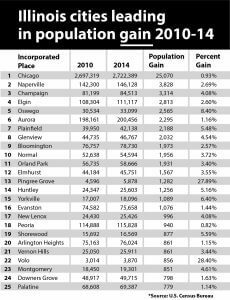 In terms of percentage population increases, the fastest growing communities from 2010 to 2014 were the small villages of Volo in Lake County and Pingree Grove in Kane County. Volo’s population swelled by slightly more than 28 percent to 3,870 residents; Pingree Grove’s population jumped by nearly 28 percent to 5,878 residents. The Village of East Dundee ranked third with 11 percent growth to 3,198 residents. Each of those villages annexed property during the time period. “Population gain may be viewed as a positive sign of growth, particularly if accompanied by a decline in vacant properties or an increase in new housing starts,” Zeemering says. 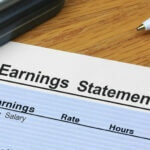 “More residents occupying more tax-paying parcels is generally viewed favorably by local officials. “However, communities experiencing rapid growth or communities confronting a capacity limit on critical infrastructure, such as a water system, may find new growth to be costly, as the local government will need to invest in new or expanded infrastructure to support new residents,” he adds. 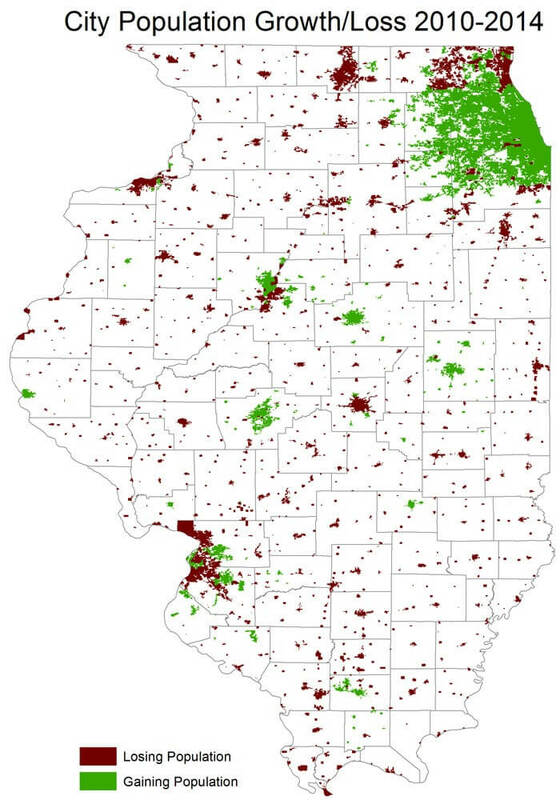 Population changes taking place in Illinois also include a shift from rural to urban settings.